What’s the punishment for bigamy? Two mothers-in-law. 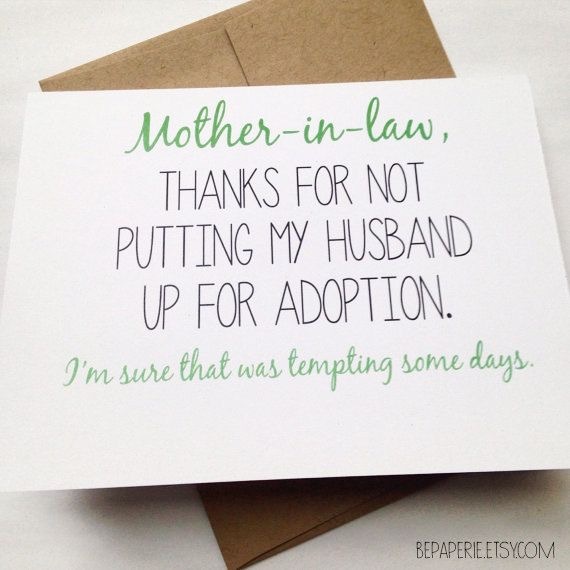 I used to think that Mother in Law jokes were just a bit of a cliche. That they didn’t really have a grounding but were the result of too much stereotypical daytime TV. Endora from Bewitched for example is the ultimate stereotypical Mother in Law. I mean you have to ignore the magical background but looking past that she pretty much sums up the whole Mother in Law image portrayed by many a spouse. Now I am quite an active participant on online parenting groups and forums and I cannot believe some of the stories I hear about Mother in Laws. From interfering in parenting decisions to openly telling their child to get a divorce, the sheer audacity of these women is mindblowing. One woman who posted was seriously contemplating a divorce if her Mother in Law didn’t stop calling her ‘the barren one’ and telling her husband that he should leave her for someone fertile (they weren’t even trying for a baby!). It is whilst reading these comments, written by sometimes desperate women, that I realise just how lucky I am! My Mother in Law is amazing! I’m sorry if you were expecting, or wanting, me to rant about her, to moan about the awful things she does and says or tell you how terrible she is to be around. I’m afraid that I can’t do that. I can’t do that because my Mother in Law is actually lovely. She does not fit the stereotypical Mother in Law image at all. 1. She is kind, fun and caring. 2. She treats me like a daughter. 3. She lets me moan to her when life is rubbish. 4. She is a godsend when I need a few hours break from the children. 5. She never interferes in my parenting decisions (although I’m sure she would like to sometimes when i’m doing an awful job of it). 6. She never tells me off about my messy house. 7. She doesn’t tell me that I don’t look after her son well enough. 8. She is a fabulous baker (and doesn’t judge when I eat more than 1 slice of cake). 9. She loves my children unconditionally. 10. She is the reason I have my husband! This Sunday, 23rd October, is National Mother in Law Day (fairly sure this might just be in America but as we usually end up stealing most of their traditions anyway, let’s just go with it) and so as we sit down to our Sunday roast let’s raise a glass to all of the amazing Mother in Laws. Here’s to you fabulous women who have defied the stereotypical image and who treat your child’s spouse like the family they are. You are great! And to my Mother in Law, a great big thank you. Thank you for raising the man I married and thank you for welcoming me to your family. I appreciate you more than you will ever know. And don’t forget that she is super glamorous! I have been blessed with mother in law who treats me just like a daughter she never had. Without her my journey as a wife and mom would have been very tough. I feel the same way. I blogged about my mother in law, she would much rather have my husband marry his ex instead of me. We haven’t spoken to her for over a year now. Oh that’s not nice for you. I’m so sorry. Oh dear. I think my relationship with my mil has actually improved over the years, especially since I had my children. Oh dear. That doesn’t sound nice. I wish I would have gotten the chance to meet my mother-in-law! Oh that’s such a shame. I’m sure that she would have loved you.